Makana’s Gift of Music Who’s Coming Up on Monday, February 29? A Night of Hula! Hula! Hula! Makana is well aware that many who attend EKK regularly have a sophisticated knowledge and appreciation of Hawaiian music. They may be malihini or kama`aina, but they are “in the know” in this arena. He first showed up at EKK 2003 during half-time when a little birdie told him that Aunty Nona had a medical emergency and could not show up at EKK that night. He was 25 years old and had long hair and was actively building his budding music career. Since that first encounter 13 years ago, GIAC has organized various gigs for Makana — at Island School EKK and with Jason Mraz at Kilauea Theatre in 2005, at the 2006 Makana Masquerade CD release Halloween party at Joe’s on the Green, at Makana SlackRock at KCC PAC in 2007, at EKK 2008 with Stephen Inglis, at the MakanaLive CD party at the Waipouli Hotel Lounge where he stood up on the table to let out his primordial scream, at the Kilohana Anniversary New Year’s Eve Fundraiser for Poutasi Concert in 2009, at the EKK 2010 Alice in Wonderland Masquerade concert, with the HPU Orchestra at KCC in 2015, and several smaller gigs. Each time he has presented a completely different show for the audience. Yes! GIAC has had a long history with Makana, and Makana has had a long love affair with Kaua`i. Coincidentally, Makana opened his program with a one of my favorite Dennis Kamakahi songs about the edible shellfish in the mountain streams of Molokai, E Hihi Wai. He prefaced the song with the spoken lyrics in English and Hawaiian. “My Dad is from Minnesota . . . very strict.” In their home they just listened to Christian and Hawaiian music. When he was in the fourth grade he was doing homework at William Lau’s home when he heard the radio. “What’s that?” he asked. His puzzled classmate asked, “What? You mean the radio?” This new amazing discovery opened the floodgates for Makana. In the next few weeks he had memorized every song and artist on every station. 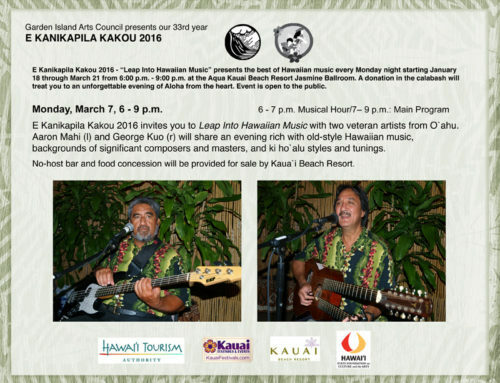 Last year was his 25-year anniversary with slack key. One day he was watching a program on TV called Masters of Hawaiian Slack Key where he saw Raymond Kane and Bobby Moderow. He attended the Ki Ho’alu Festival with his mom where he saw Raymond Kane and the 20-year old Bobby Moderow playing. His not-shy Mom dragged Bobby over to her son and told him, “You’re going to teach my boy.” Scared of Makana’s mom, Bobby agreed and thus began Makana’s journey with slack key. Makana and his Dad started lessons with Bobby. Proud of his Portuguese heritage, Bobby makes sure everyone understands him completely, so the lessons were packed with a lot of verbal instructions and a few minutes of play. It did, however, give Makana a solid foundation, enough so that when Bobby took him to Raymond Kane’s home with the one song that he had learned in three months, and Raymond asked this 11-year-old skinny haole boy to play, Raymond growled to the other 18 slack key students “This is how to play slack key; you guys all rubbish!” He did Bobby proud. As Makana’s interest grew, he sought out Sonny Chillingworth as his teacher, mentor and friend. When the missionaries demonized everything Hawaiian, slack key music went into hiding. Ki Ho`alu is a very private style of music that musical families guarded with a great deal of secrecy. As artists began to record, however, slack key began to grow in popularity, and very recently, a slack key exhibition, dedicated to the contributions of the Ki Ho`alu greats, was installed in the Grammy Museum at the Smithsonian in D.C. He then explained how he plays the bass rhythm with his thumb and the melody with his fingers playing only on the top two strings. He demonstrated how the bass, rhythm and melody comes together so a beautiful symphonic sound comes out of a single guitar played by a single musician. Because the three are so malleable, slack key is unique to each individual style. He played an example of Gabby’s style followed by Atta Isaac’s mambo-jazz style. 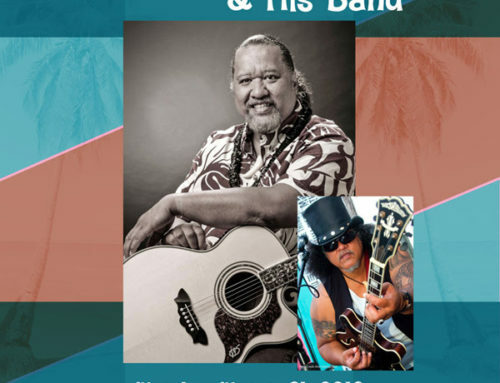 Known as a traditional Hawaiian musician, Gabby was Influenced by big bands, jazz and Three Dog Night, whose rock ‘n roll licks he incorporated into one of his songs. Makana stated that there is no such thing as traditional Hawaiian music because the music is always evolving. One of the most revered slack key artists was Fred Punahoa from Kalapana on the island of Hawai`i, whose style is carried on by the Sonny Lim and Ledward Kaapana lineage. It’s a style that is fun and playful. To demonstrate, he played Pau Pilikia and Maunaloa Slack Key, which he calls The Poi Song. I recall the first time I saw Makana play at Kukui Grove Center stage. He might have been 17 years old and playing The Poi Song. Over the years that song went through many iterations until one day he was playing it with one foot while balancing on the other leg. It still seems to be one of his favorite songs to play. At that time I thought to myself, “He’s cute but I wonder how long he’ll be around.” Well . . . I got my answer. Jazz hugely influenced Hawaiian music during the early 20th century; Hawaiian Swing Jazz was from 1916 to 1920 one of the biggest selling styles of music in the world. To demonstrate, he played How’s Ya Do? Tongue-in-cheek, he confessed that he was toying with the idea of creating a virtual reality of himself to perform so he could sit back, plant kalo and collect royalties. Not far fetched because he loves growing his own food. Uncle Cyril Pahinui, son of Gabby, who Makana considers a gentle and loving man, a huge supporter of Makana’s music and an amazing force in Hawaiian music, was greatly influenced by Atta Isaac. Panini Puakea is a song that Cyril recorded. Chillingworth and Kane. Both masters in slack key and very different in style, but each had no use for the other and criticized the way that the other played. After a Ki Ho’alu performance, Raymond launched into Makana, “Don’t play all that crap your learned from Uncle Sonny. Sonny got no soul,” and cautioned the embarrassed Makana about playing all that flashy music. “Back in the olden days, the cowboys played the music to put the cows to sleep so they didn’t play too loud and too fast. Boy! Don’t wake the cows!” Makana then played Punahele, a soft and mellow instrumental with a great deal of soul. Makana said that people think he’s a radical crazy maniac, which he is, but he is like the banyan tree because it has long roots that run as deep as the branches grow high. For him, slack key music is like breathing; it gives him peace. People do not come to hear slack key at concerts. If that is all he played, he would need to get a day job. He then sang the beautiful Pauoa Liko Ka Lehua. What song represents the Beamer brothers? There is no contest. He launched into the most hilarious version of Mr. Sun Cho Lee with all the sounds, and ethnic embellishments that artists often add to the verses to clarify each race. He prefaced his song with a straw poll to see how many in the audience were familiar with words like Borinki, Portagee, Kepani, Pa-ke or Chang and who had never heard this song before. “If you are offended, don’t come back!” he gave fair warning. There were some newbies present, but they quickly got inducted into the local style of making fun of all the races but in a playful and fun way. It was a Cliff’s Notes condensed lesson on growing up in this crazy stew pot of ethnicities; it’s hilarious but it’s also “Edumacation” about life in Hawai`i. He also changed several words to be current in what’s going on in Hawai`i. Makana’s favorite verse was sung with typical Pilipino accent and enunciation, pointing out that Pilipino has plenty pride – pried chicken, pried egg, pried rice. The guitar soundtrack of this song is so important because, like in the movies, it builds anticipation for each line that you know is coming and is so playful, just like the lyrics. Dad was strict about what music Makana was exposed to. He was so hungry for music and was absorbing everything he heard. He felt he was blessed to learn from so many masters in Hawaiian music that really helped him to establish a strong untainted foundation as he became exposed to new music by Leo Kottke, Jimmy Paige and others whose music impacted his development. Not resting on his musical laurels, Makana wanted to debut a new song that is based on an old song that was adapted and set to music by Alice Namakelua who has a style similar to Raymond Kane. He sang Kamanu in the original style that had been recorded by many. The lyrics tell a tragic Romeo and Juliet love story so full of passion. Makana changed it to a fast-paced dynamic instrumental with a chant-like melody very different from the original song. His friend described it as Led Zeppelin meets Elvis meets Brothers Cazimero; exactly what Makana was going for. Deep in an Ancient Hawaiian Forest is an instrumental song recorded on the soundtrack for the movie Descendants. With the passing of Raymond Kane, Genoa Keawe, and a number of other masters, Makana was feeling the urgency of this transitional time and the fact that this place where generations of people called home is being destroyed in such a short span of time, i.e., the `ohia trees and blossoms on Hawai`i island being decimated by disease. The lyrics plead to the kupuna to “give to us your eyes so we can see the future through your eyes.” We take for granted our way of life. This song speaks to the urgency of a culture that is being destroyed. He chose to add lyrics to the song, Ku`u Lei o Ka Po, My Lei of the Night, with the help of a friend with the command of ‘olelo Hawai`i in a very special place, a private home that houses the world’s largest collection of Polynesian artifacts and treasures of other cultures. There is so much mana in the room that he was shaking just by being surrounded by all these priceless artifacts. The song had the most insane tuning, which is why Makana never plays it live; the tuning could take as long as the song. But tonight he wanted to play the song for us. The leo of the song was pleading; it was like a pule woven into the poignant strains of the strings on the slack key guitar. The final lines were like a primordial call out to the universe, a plea for positive action to reverse the increasing negative trends that are surrounding and choking us. He put out a challenge to all Hawaiian musicians to use their music to do what is necessary to perpetuate the culture. Although much of Hawaiian music is fun and playful, playing only music that is light, fun and joyful does not help people who are facing genocide. Musicians need to go deeper with the intention of composing songs that address the issues. We (musicians) have the voice; we go out to sing for the world and take the message, so we need to be mindful of the power and the role of musicians to make a change. I wrote earlier that Makana has had a long love affair with this nurturing island called Kaua`i. He tried for many years to write this song but did not know how to do it because he did not know where to start. So finally the song came to him and he wanted to debutKaua`i for the EKK audience. It’s an instrumental so it conveys feelings with sounds that create pictures in your mind. When you close your eyes and let the music take you on an aerial view of the island, you soar over the chiseled mountains and lush valleys with so many shades of green juxtaposed against the brilliant red Kaua`i earth, with brilliant silver strings of waterfalls slicing through the face of the cliffs. You marvel over the rolling hills with subtle hues of colors, set against the dense forests and the quilts of tidy taro fields. You see the remnants of tidy little plantation towns spread strategically along the one road that goes around the island, gradually spreading out like fingers and beginning to touch each other. Tiny little harbors along the coastline provide venues to connect with each other by ocean and to the outside world. The waves tumble in endlessly over white, brown and black sandy beaches, changing the sand bars at the mouth of each river where local folks spend a good part of their lives. You can enjoy the dolphins and turtles swimming alongside your ocean craft and watch the water for that glorious splashing tail of a breaching whale. As you stretch your eyes out to the horizon, you see the blue expanse of ocean blending into the sky without a hint of a horizon except for a line of clouds waiting for the setting sun to set the panoramic sky ablaze with a palette splashed from the heavens. I leave you with this melody of words inspired by music at the hands of a musical genius. Koi, from his Koi CD is one of Makana’s signature songs in which his distinctive slack-key style shines. Lotta whistles and huge applause. Of course no performance by Makana is complete without Ku`ulei Awapuhi by Emily Taylor. He played this song standing up so you could get the whole effect of his style of slack key. Hana hou screams by the standing audience prompted Makana to play and sing Cuanda Calienta el Sol, a Spanish song that had been recorded by Sonny Chillingworth. This Gift of Music evening was nothing short of exceptional on many levels. In the opening 45 minutes of the program, EKK fans and volunteers put on a fun-filled unique fashion show inspired by the youthful Fashionistas of Harajuku near Tokyo, Japan. It was a fun way to fill a forty-five minute block of time and to raise some donations for EKK 2017. The Kamoa `ukulele beautifully decorated by Max Graham was won by Dan Retuta of Crestone, Colorado. If you have a disability and need assistance for Monday events please email Carol Yotsuda at giac05@icloud.com. 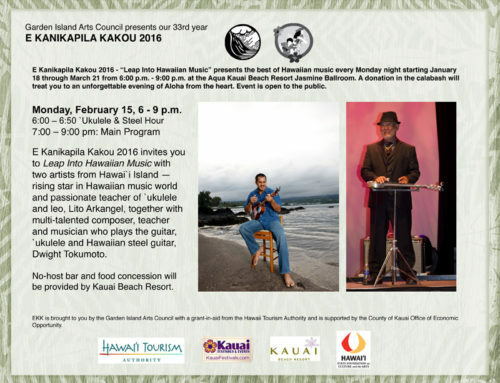 E Kanikapila Kakou 2016 Hawaiian Music Program is funded in part by the Hawai`i Tourism Authority, the County of Kaua`i Office of Economic Development, and the Garden Island Arts Council supporters with support from the Kaua`i Beach Resort. Garden Island Arts Council programs are supported in part by the State Foundation on Culture and the Arts through appropriations from the Hawai`i State Legislature and the National Endowment for the Arts.